Egg-Genesis is both Silver's third and Sonic's fourth boss in Sonic the Hedgehog (2006). For Silver, it is fought in White Acropolis, while Sonic faces the machine after Radical Train. Eggman's Egg-Genesis is essentially a huge, floating weapons platform. Four giant missile launchers jut out from a central core, which sports under-mounted laser batteries and point defences above. Due to the hedgehogs' different gameplay styles, Sonic and Silver have to utilise different tactics to defeat the battle fortress. In White Acropolis, Silver must simply pluck the Egg-Genesis' swarms of missiles out of the air and hurl them back en masse. 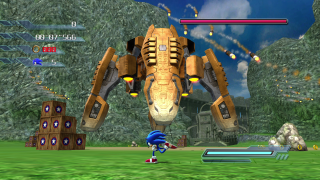 Sonic, on the other hand, has to dodge the hail of munitions and wait until Egg Fliers or Egg Gunners appear; using them as Homing Attack stepping-stones, Sonic can get onto the boss machine's extended missile arms and run up to the central core, where two or three Bound Attacks will deal the damage. Bringing the Egg-Genesis' health bar down to zero isn't quite the end of the boss, though. In a final act of spite, Eggman attempts to have the machine crash on top of Sonic or Silver. Just keep running around the edge of the arena to avoid being squished. This page was last edited on 8 April 2018, at 08:50.